tcpdump is the premier network analysis tool for information security professionals. Having a solid grasp of this über-powerful application is mandatory for anyone desiring a thorough understanding of TCP/IP. Many prefer to use higher level analysis tools such as Ethereal Wireshark, but I believe this to usually be a mistake. In a discipline so dependent on a true understanding of concepts vs.rote learning, it’s important to stay fluent in the underlying mechanics of the TCP/IP suite. A thorough grasp of these protocols allows one to troubleshoot at a level far beyond the average analyst, but mastery of the protocols is only possible through continued exposure to them. When using a tool that displays network traffic a more natural (raw) way the burden of analysis is placed directly on the human rather than the application. This approach cultivates continued and elevated understanding of the TCP/IP suite, and for this reason Istrongly advocate using tcpdump instead of other tools whenever possible. Below are a few options (with examples) that will help you greatly when working with the tool. They’re easy to forget and/or confuse with other types of filters, i.e. ethereal, so hopefully this page can serve as a reference for you, as it does me. First off, I like to add a few options to the tcpdump command itself, depending on what I’m looking at. The first of these is -n, which requests that names are not resolved, resulting in the IPs themselves always being displayed. The second is -X, which displays both hex and ascii content within the packet. The final one is -S, which changes the display of sequence numbers to absolute rather than relative. The idea there is that you can’t see weirdness in the sequence numbers if they’re being hidden from you. Remember, the advantage of using tcpdump vs. another tool is getting manual interaction with the packets. -s : Define the snaplength (size) of the capture in bytes. Use-s0 to get everything, unless you are intentionally capturing less. Here’s a capture of exactly two (-c2) ICMP packets (a ping andpong) using some of the options described above. Notice how much we see about each packet. Expressions allow you to trim out various types of traffic and find exactly what you’re looking for. Mastering the expressions and learning to combine them creatively is what makes one truly powerful with tcpdump. There are three main types of expression:type, dir, and proto. tcpdump allows you to send what you’re capturing to a file for later use using the -w option, and then to read it back using the -roption. This is an excellent way to capture raw traffic and then run it through various tools later. As you can see, you can build queries to find just about anything you need. The key is to first figure out precisely what you’re looking for and then to build the syntax to isolate that specific type of traffic. You can also filter based on specific portions of a packet, as well as combine multiple conditions into groups. The former is useful when looking for only SYNs or RSTs, for example, and the latter for even more advanced traffic isolation. Keep in mind the reasons these filters work. The filters above find these various packets because tcp looks at offset 13 in the TCP header, the number represents the location within the byte, and the !=0 means that the flag in question is set to 1, i.e. it’s on. As with most powerful tools, however, there are multiple ways to do things. The example below shows another way to capture packets with specific TCP flags set. Finally, there are a few quick recipes you’ll want to remember for catching specific and specialized traffic, such as IPv6 and malformed/likely-malicious packets. tcpdump command is also called as packet analyzer. tcpdump command will work on most flavors of unix operating system. tcpdump allows us to save the packets that are captured, so that we can use it for future analysis. The saved file can be viewed by the same tcpdump command. We can also use open source software like wireshark to read the tcpdump pcap files. In this tcpdump tutorial, let us discuss some practical examples on how to use the tcpdump command. When you execute tcpdump command without any option, it will capture all the packets flowing through all the interfaces. -i option with tcpdump command, allows you to filter on a particular ethernet interface. In this example, tcpdump captured all the packets flows in the interface eth1 and displays in the standard output. Note: Editcap utility is used to select or remove specific packets from dump file and translate them into a given format. When you execute tcpdump command it gives packets until you cancel the tcpdump command. Using -c option you can specify the number of packets to capture. The above tcpdump command captured only 2 packets from interface eth0. Note: Mergecap and TShark: Mergecap is a packet dump combining tool, which will combine multiple dumps into a single dump file. Tshark is a powerful tool to capture network packets, which can be used to analyze the network traffic. It comes with wireshark network analyzer distribution. The following tcpdump syntax prints the packet in ASCII. Some users might want to analyse the packets in hex values. tcpdump provides a way to print packets in both ASCII and HEX format. 0x0000:  0050 569c 35a3 0019 bb1c 0c00 0800 4500  .PV.5.........E.
0x0020:  69c4 f999 0016 57db 6e08 c712 ea2e 5010  i.....W.n.....P.
0x0000:  0050 569c 35a3 0000 0000 0000 0800 4600  .PV.5.........F.
tcpdump allows you to save the packets to a file, and later you can use the packet file for further analysis. You can read the captured pcap file and view the packets for analysis, as shown below. In all the above examples, it prints packets with the DNS address, but not the ip address. The following example captures the packets and it will display the IP address of the machines involved. You can receive the packets based on the protocol type. You can specify one of these protocols — fddi, tr, wlan, ip, ip6, arp, rarp, decnet, tcp and udp. The following example captures only arp packets flowing through the eth0 interface. If you want to know all the packets received by a particular port on a machine, you can use tcpdump command as shown below. The packets will have source and destination IP and port numbers. Using tcpdump we can apply filters on source or destination IP and port number. The following command captures packets flows in eth0, with a particular destination ip and port number 22. If two different process from two different machines are communicating through tcp protocol, we can capture those packets using tcpdump as shown below. You can open the file comm.pcap using any network protocol analyzer tool to debug any potential issues. In tcpdump command, you can give “and”, “or” and “not” condition to filter the packets accordingly. These are my personal notes on getting Crashplan up and running on a Raspberry Pi running Wheezy 2015-05-05. Some words may be copied straight out from the above two threads so full credit to them – THIS IS NOT MY WORK! REPEAT : This is NOT MY work, only my process for personal notes! Image the disk using the tool! Connect up the Pi and boot up for the raspi-config splash screen. The Crashplan application can be quite intense on the disk and the pi’s default swap file on the SD card is not going to cut it. First thing I did was move the swap file to a 2GB USB drive attached to the Pi. 1. I have this working on a Raspberry Pi Model B. Started with the NOOBS 8G SD Card. I used information from above, the Oracle Java 1.7 post, and several other pages to build a Pi with 1TB WD Passport attached. My MacBook Air has been backing up to it for over an hour so far with no issues. Many thanks to Jon Rogers, Bion, Brad Peterson, and others for contributions toward getting this done. I am posting my documentation which sections just duplicate some of the above post and comments. There are some differences and I also document setting up the USB drive, etc. all in one place in case it helps someone. Rather than use a variable like path/to/swapfile, I use the real names in case someone will benefit from an actual example. Make sure you adjust accordingly. Select Modest for a 14% boost in MHz with no overvolt to start or no overclock. Get it working first so you know if the overclock is the culprit if you have problems. Select Finish when done with configuration options and allow a reboot. If you haven’t already, mount your USB drive. Since I plan to leave this drive attached as a primary backup volume, I want to automount it on reboot. Because I may add more USB drives in the future, the safest way to mount the drives is using its Unique Identifier (UUID). This mounts the drive using the entry in /etc/fstab. Thanks to Brad Peterson (above): Raspbian by default will have 100MB swap on the SD card. This is not a good idea. It is small and it will kill the SD card. Since we have an external USB drive attached as backup media, we will use this for swap instead. Now we make it mount at boot time. Now on to installing Java. We are going to try Oracle Java since it offers significant performance advantages over OpenJDK on ARM platforms. Courtesy of eben athttp://www.raspberrypi.org/archives/4920. Download the patched libjtux and md5 library, courtesy of Jon Rogers. Extract as necessary and copy the .so files to /usr/local/crashplan/ replacing the files that are there. I have multiple edits for this commentary. The cpusb01 should be usbhd to be consistent with the rest of the document or this will look like it’s working but will fail once you start backing up (because your swap and backup location will be on the SD card). I tested this all again and it worked. I am getting over 80 Mbps right now and I do plan to go back and experiment with overclocking. If it is a fresh install, that is it. If you already have a cache built up, you will want to move that before you restart the service. The same goes for the log files. You will find “/usr/local/crashplan/log/xxxx.log” entries in my.services.xml as well. Next we move on to running a remote client. I am not going to detail this since CrashPlan has it detailed on one page here. If you tried recently to install CrashPlan and it failed, or wouldn’t stay running for very long, it looks like the most recent installer has fixed whatever was broken. The current download from Code42’s site should be version 4.7 or newer, and readers are reporting that all is well again. Then download and install the latest version from Code42. You’ll need to repeat all of the steps in this article, but as long as you point the backups to the same directory you were using before, CrashPlan should pick them up and continue using them, so you don’t have to start completely over. You will need to reinstall and re-patch the UI, and then sign in to your account again, just like the first time around. Recently, Code42 (CrashPlan’s developer) updated their installation files, and the instructions in this article stopped working. Thanks to the work of several readers (see the comments), I’ve been able to revisit this article and update the instructions so that they work once again. See the end of this article for additional troubleshooting information if you find that your installation mysteriously stops working one day. One of the main jobs of a proper “home server” is to back up the other computers on the network. You could accomplish this through the file shares I covered earlier in the series, but I’d like to try something a little more ambitious. There’s a great product out there called “CrashPlan” (www.code42.com/crashplan). The company has subscription offerings that will store your backups in their “cloud”, similar to other products like Carbonite (www.carbonite.com), but if you can supply your own storage, CrashPlan is free. The free version of CrashPlan can back up to a local drive on the same computer, or to another computer that is also running CrashPlan. Your Raspberry Pi Home Server can be that “other computer”, and handle the backups for all of the computers in your house. Note: It is possible to get CrashPlan to backup to a share on your local network, too, but it involves jumping through some symbolically-linked hoops, and won’t be covered here. I didn’t figure all this stuff out on my own, not by a long shot. I am standing on the shoulders of other geeks here. 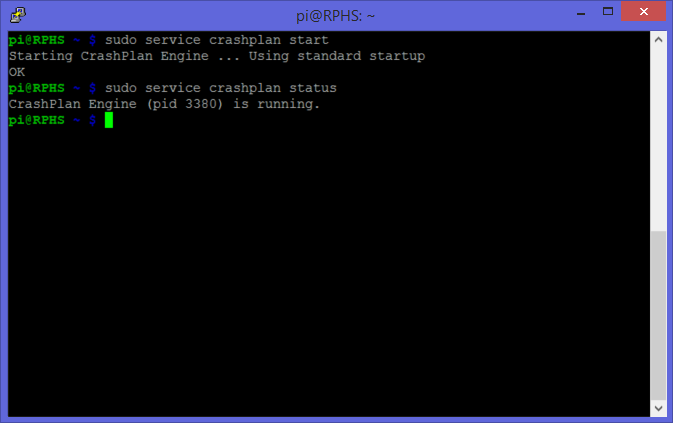 In 2012, Jon Rogers wrote a blog post about getting CrashPlan running on the Raspberry Pi. That article is largely the basis for this one. In February of 2013, Bion Ren posted an updated version of Jon’s instructions, replacing OpenJDK with Oracle’s Java 8 preview. He also called attention to a post by Torbjörn that solves a major configuration issue, and a comment by Brad Peterson that addresses a rather serious stability issue with regards to swap file use. I am posting this because I wanted to gather together a complete, updated set of end-to-end instructions for adding CrashPlan to the Raspberry Pi Home Server I’ve been describing in this series. As I have pointed out before, I am by no means a Linux expert. I could not have done this without the work of those that went before me. CrashPlan was not written with tiny computers like the Raspberry Pi in mind. It expects to be running on a computer with more resources in general, and more memory in particular. When it doesn’t have enough memory, it will start paging to the swap file. Whether or not this will wear out your SD card is a rather contentious subject, and I’m not going to pretend that I know the answer to that one. One thing is for sure, though, SD card-based swap files are slow. As a result, I cannot recommend running CrashPlan on a Raspberry Pi unless you have moved your swap file (and I recommend your root filesystem as well) onto a proper hard drive as covered in my “Adding a hard drive” post. If you skipped that article, this isn’t going to work for you. The SD card just doesn’t have enough space to hold backups. In order to serve as a useful CrashPlan backup destination, you’re going to have to have a big hard drive anyway, so you may as well take full advantage of it. In addition, CrashPlan does some pretty heavy lifting in the background, compressing and pruning backups, and doing general housekeeping. This can use a lot of CPU, and make the rest of your server’s functions slow to respond. As I’m writing this, my own CrashPlan instance is using up about 60% of my CPU time compressing backups from my primary computer. CrashPlan is usually pretty good at getting out of the way when other programs need to think, at least on the desktop. If it says “1.8.0” or above, you’re all set to go. If not, you may need to install the Java Runtime Engine (JRE) yourself. Unfortunately, I can’t find a simple JRE installer for the raspberry pi at this time, so you’ll just have to install the whole Java Development Kit (JDK). Only do this if you don’t already have JRE8, as checked in the last step. When the Java installation completes, you are ready to install CrashPlan itself. Since there are new versions being released all the time, I can’t give you a simple url to “wget”. Go to http://www.code42.com/crashplan/thankyou/?os=linux, from a browser on the Pi itself, and the download should start automatically. I used the new “Web” browser that’s part of the Raspbian image, so the file ended up in /home/pi/Downloads. Depending on your browser, your downloads may go somewhere else. If you can’t figure out where they are going, just download the package from your primary computer, and copy it over on a flash drive. When the download is complete, find the .tgz file and extract it. Since I was already in the desktop environment to run the browser, I took advantage of the modern amenities, right-clicked the file and picked “Extract here” from the context menu. Sometimes it’s nice to live in the future, if only for a moment. Execute the installer from the command line. The install script will prompt you for anything it needs, including accepting a really long EULA that you probably won’t really read (q exits the reader). You can accept most of the defaults and let the installer create any missing folders, but one directory you should probably change is the backup location. The answer will probably say “CrashPlan Engine is stopped.”, and even if you try to start is manually, checking its status will still say “stopped”. Don’t worry about it if you don’t know what that means. All it means to us is that we’re going to have to trick CrashPlan into running on the JRE that’s already on the Pi, instead of the one it installed itself. Thanks to Rainer Boehme and Matt for showing me this in the comments. The first order of business is to blow away the useless x86 version of JRE7. Next, we’ll create a “symbolic link”, which is a kind of shortcut on your hard drive. Symbolic links make things in one place appear to be somewhere else, or even in multiple places. You can use them to keep one physical copy of a file, but have it appear in many different places. Here, we’re going to use one to make the raspberry pi-friendly JRE8 appear where CrashPlan put its raspberry-unfriendly JRE7. CrashPlan is now installed, but it’s not very happy. If you were to look in the/usr/local/crashplan/log/engine_error.log file right now, you’d see a complaint about the /usr/local/crashplan/libjtux.so file being the wrong version. Luckily for us, Jon Rogers already fixed that problem. Return to the terminal, and go to the /usr/local/crashplan folder where you will find the file in question. Remove the bad libjtux.so file, and replace it with the one that Jon Rogers patched. There’s also something wrong with the libmd5.s0 file, so replace that one the same way. These two files should allow the CrashPlan engine to start up. Next, edit the CrashPlanEngine file. Find (ctrl-w) the line that starts with “FULL_CP=”, and add “/usr/share/java/jna.jar:” (don’t forget the colon) to the beginning of the string value. To check whether everything is working, try launching CrashPlan manually. If everything went well, you should get a message indicating that the CrashPlan service is running. Having a backup system like CrashPlan won’t do you much good if it doesn’t start back up again after your power goes out. Type the following command to automatically configure CrashPlan to auto-start after a reboot. To make sure that it worked, reboot the Raspberry Pi, log back in, and check the status of the service. It should be running. At this point, you have a working CrashPlan server, but no way to communicate with it. You need to get a GUI talking to the CrashPlan engine so that you can configure backups, change preferences, and generally fiddle with the knobs. LiquidState has a very detailed walkthrough of configuring CrashPlan to answer to a UI running on a different computer. If that’s how you want to do things, then go ahead, but it’s not that much harder to get the UI running on the Pi’s own X desktop. If you were to try the CrashPlan icon that the installer has placed on your X desktop right now, it wouldn’t work because the version of the Standard Widget Toolkit (SWT) library that CrashPlan installed won’t work on the Raspberry Pi. You can double-click that icon all day and it will never get you anywhere until we fix this problem. Next, replace the SWT library that CrashPlan installed with the compatible one. Note: The version of this file is subject to change, so if the command complains, use tab-completion to help find the correct filename. Type up to “/usr/lib/java/swt” and then hit the Tab key to fill in the rest. This file has changed more than once since this article was first published. You can now run the CrashPlan UI directly from the shortcut the installer put on your X desktop. The first run can be pretty slow, so give it some time. You’ll either need to connect to an existing CrashPlan account, or create a new one. It’s been so long since I signed up, that I honestly couldn’t walk you through the steps anymore, but all you’re going to need is what’s included in the free version. Now that you have a CrashPlan server, it’s time to start backing things up. Install the CrashPlan software on the computer you want to back up, and open the UI. Sign in using the same account information you used above. From here on, it’s just business as usual. Choose what you want to back up, and select “another computer” for the destination. If you signed in with the same account on the client and server, they should see each other in the list, and you can pick the Raspberry Pi as your backup location. If your computers have trouble seeing each other, I’d suggest looking in the supportsection of the CrashPlan site. CrashPlan does a pretty good job of opening its own firewall holes via UPnP, but perhaps your router doesn’t support that, or maybe you’ve turned it off on purpose. Such networking issues are beyond the scope of this article. Your mileage may vary. Google is your friend. Warning: The first time you back up another computer it will take a very long time, and it’s going to peg the Raspberry Pi’s CPU, just like when MiniDLNA was indexing your media. Don’t worry, you’re not going to hurt the Pi. Mine was at 100% CPU usage for more than a day, and the CPU temperature never rose above 64°C. As long as the temperature stays below 80°C, you have nothing to worry about. Subsequent backups will also run up the CPU, but not for nearly as long. Now we come to the real payoff, and the part that’s going to keep your stuff safe in the event of a fire or flood. When you use CrashPlan to back up to another computer, that other computer does not have to be on the same local network as the computer it’s backing up. It can be anywhere on the internet. It could be on the other side of town, or in a different state. A Raspberry Pi is cheap enough that you could just Velcro one to the side of a big USB drive and leave the whole thing at a buddy’s house. If your buddy does the same, and parks a CrashPi (as I am now calling it) at your house, then you’ll both be protected in the event of a disaster… unless, of course, you live in the same apartment building. You should choose a location for your off-site backups that is far enough away that both sites are unlikely to fall victim to the same disaster. To build a CrashPi, all you need to do is build another Raspberry Pi Home Server, leaving out all the parts that CrashPlan doesn’t need, which is actually most of them. 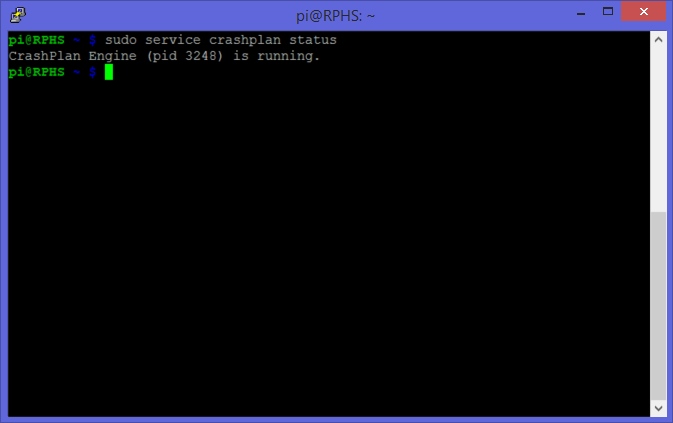 Follow this subset of the Raspberry Pi Home Server blog series, and you’ll have made a CrashPi. Start with a small, cheap SD card. You only need 4GB. If you want SSH access to maintain the CrashPi remotely, your buddy will have to punch a hole in the firewall, or put the CrashPi in his/her DMZ. This will let you check in on your CrashPi to perform maintenance, install updates, etc. Your buddy will have to punch a hole in the firewall, or put the CrashPi in his/her DMZ. You may have noticed something CrashPlan calls a “backup code”. This is a unique code that identifies a specific CrashPlan installation. You can give this code to a friend to let them back things up to your server, even though you have different accounts. For instance, when the kids head off to college, you might want to let them use your Raspberry Pi Home Server as a backup destination. All they’ll need is that particular computer’s “backup code”, which you can get from “Friends” tab in the CrashPlan UI. As far as core home server functionality goes, the Raspberry Pi is already doing a lot. It’s sharing files and media on the local network, downloading things for you, and backing up your computers, even over the internet when you’re away from home. How about Virtual Private Networking (VPN) access to your home network when you’re away? Sound good? In the next post, we’ll set up OpenVPN so that you can have all the safety and security of your home network, even from the sketchiest of airport coffee shop networks. I have a sneaking suspicion that this article is going to see more updates than most, so I’m starting a section here at the bottom to catch any updates. CrashPlan UI has stopped working! If you have already installed CrashPlan in the past, and find that the UI doesn’t work anymore after performing an apt-get update/upgrade, you’ll need to repeat the final step of the article once again to put things back to normal. Simply run the following commands to replace the SWT library that CrashPlan installs with one that is compatible with the Pi, and you should be up and running again. You may need to do this each time you do an apt-get update/upgrade, unfortunately. I haven’t quite figured out what causes the problem just yet, but since CrashPlan wasn’t installed through apt-get, that shouldn’t be it. Just remember this in case your UI stops working one day.